Because of Pluto's slow, 6.4-day rotation, Approach Phase 3 includes the best, second-best, and third-best rotation coverage before closest approach, yielding the best global maps of Pluto and Charon. The fields and particles instruments, PEPSSI and SWAP, may detect pickup ions and the bow shock in the very last days of this phase. LEISA and Alice can begin looking for variability on the surface in infrared and ultraviolet wavelengths. Later in this phase, LORRI and Ralph will search for clouds or hazes, and if there are visible clouds, they can track winds. There was a brief mission update this morning on NASA TV. The spacecraft is healthy, and has successfully performed deep searches for previously undiscovered moons and dust hazards. Pluto's faintest moon, Styx, is now "a piece of cake" to detect with the LORRI camera, but no other moons beyond Charon, Kerberos, Hydra, Styx, and Nix have been found. This is very good news for spacecraft safety. A programming note: I'm taking a pre-Pluto vacation starting tomorrow, until July 3. While I'm gone, the apparent size of Pluto will double! The following week, I'll be headed to Maryland to be on site at the Applied Physics Laboratory when all the most exciting data arrive on the ground. But let's talk about what we can see now. The spacecraft is finally close enough that its Ralph Multicolor Visible Imaging Camera, or MVIC, is resolving Pluto and Charon as disks several pixels across. These early images still don't reveal details like LORRI's do; they're a promise of what's to come. They do show how Pluto has distinctly more color than Charon. Don't over-interpret the color, though; MVIC sees into the infrared, so it's not quite the same as what the human eye would see. New Horizons' Ralph Multicolor Visible Imaging Camera, or MVIC, took the photos for this animation of Pluto and Charon from May 29 to June 3, approaching from 55 to 49 million kilometers' distance. Images taken through infrared, red, and blue filters were combined to make these images. MVIC has about 5 times lower resolution than the LORRI camera. MVIC color data can be used to colorize higher-resolution LORRI images, and that's exactly what Ian Regan did here. At this point, it's not really worth trying to figure out what all the spots on Pluto are; some of them are surely just image processing artifacts. Wait just a couple weeks and we'll find out what the face of Pluto really looks like! For today, just enjoy the pretty view. 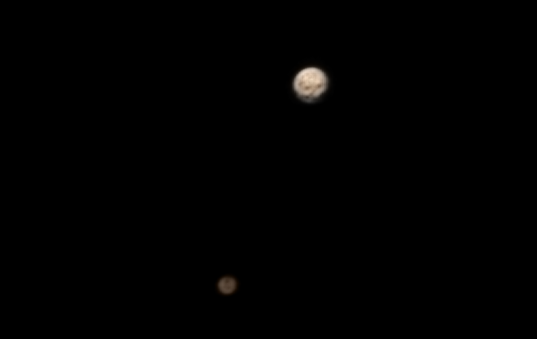 A lower-resolution MVIC color image from May was used to colorize a higher-resolution LORRI image to make this view of Pluto and Charon in color. 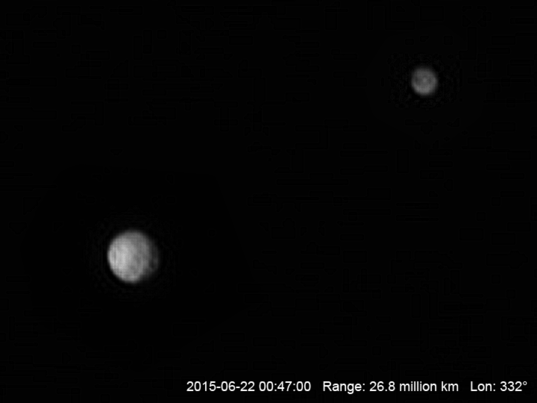 Meanwhile, although spottier Pluto gets all the press, Charon is beginning to show off surface features, too. 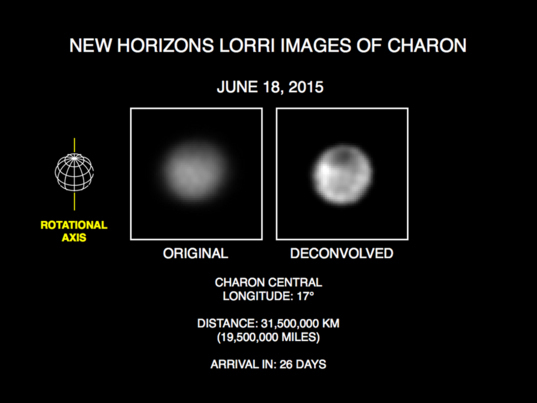 At a distance of 31 million kilometers, New Horizons' LORRI camera began to discern surface features on Charon, including a "dark pole." Finally close enough to start losing sleep due to the excitement!!! To me this is like APOLLO 8! Back in 2006 I was 14 years old. I wondered how my life and the world would look like when we finally see this unknown and wondrous world. This mission inspired me to choose to study physics and today I work at the IAEA after discovering my love for nuclear energy and it's applications. Thank you planetary society for helping to inspire young people and grown ups alike. I know the resolutions not very good, but it looks as if Pluto may have an equatorial ridge, like the one on Iepetus. Is the gravitational center inside Pluto radi or very close ( don't know if the viewpoint tricking me here ! )? Can his position influence at some point and give interesting features on Pluto's surface ? I hurry to see that !! Christmas is coming!!! Emily, it's bad practice to use acronyms like LORRI (Long Range Reconnaissance Imager) without defining them first. You can't assume your audience knows them. Please don't continue to do this in future articles. Otherwise, thanks for the great updates! Does the Iapetus-like ridge in the 2015-06-22 00:47:00 LORRI image (noted by commenter Ichiban) follow the equator? A frozen-in bulge from tidal despinning, one hypothesis for Iapetus, could work for Pluto-Charon. If what I read on another site is correct. The dark circular patch on the left is believed to be the north polar cap. The northern hemisphere is tilted toward the sun. So what appears to be a ridge should be around the equator. Or, it could be a trick or light and shadow and low resolution. Just have to wait and see.